This is a killer talk I came across from Hedge Fund manager Mark Sellers, speaking to some Harvard MBA kids on what it takes to make it in markets. Regardless of whether you consider yourself a trader or investor, Mark’s “seven traits” apply. First of all, I want to thank Daniel Goldberg for asking me to be here today and all of you for actually showing up. I haven’t been to Boston in a while but I did live here for a short time in 1991 & 1992 when I attended Berklee School of Music. I was studying to be a jazz piano player but dropped out after a couple semesters to move to Los Angeles and join a band. I was so broke when I lived here that I didn’t take advantage of all the things there are to do in Boston, and I didn’t have a car to explore New England. I mostly spent 10-12 hours a day holed up in a practice room playing the piano. So whenever I come back to visit Boston, it’s like a new city to me. One thing I will tell you right off the bat: I’m not here to teach you how to be a great investor. On the contrary, I’m here to tell you why very few of you can ever hope to achieve this status. If you spend enough time studying investors like Charlie Munger, Warren Buffett, Bruce Berkowitz, Bill Miller, Eddie Lampert, Bill Ackman, and people who have been similarly successful in the investment world, you will understand what I mean. I know that everyone in this room is exceedingly intelligent and you’ve all worked hard to get where you are. You are the brightest of the bright. And yet, there’s one thing you should remember if you remember nothing else from my talk: You have almost no chance of being a great investor. You have a really, really low probability, like 2% or less. And I’m adjusting for the fact that you all have high IQs and are hard workers and will have an MBA from one of the top business schools in the country soon. If this audience was just a random sample of the population at large, the likelihood of anyone here becoming a great investor later on would be even less, like 1/50th of 1% or something. You all have a lot of advantages over Joe Investor, and yet you have almost no chance of standing out from the crowd over a long period of time. And the reason is that it doesn’t much matter what your IQ is, or how many books or magazines or newspapers you have read, or how much experience you have, or will have later in your career. These are things that many people have and yet almost none of them end up compounding at 20% or 25% over their careers. I know this is a controversial thing to say and I don’t want to offend anyone in the audience. I’m not pointing out anyone specifically and saying that you have almost no chance to be great. There are probably one or two people in this room who will end up compounding money at 20% for their career, but it’s hard to tell in advance who those will be without knowing each of you personally. On the bright side, although most of you will not be able to compound money at 20% for your entire career, a lot of you will turn out to be good, above average investors because you are a skewed sample, the Harvard MBAs. A person can learn to be an above-average investor. You can learn to do well enough, if you’re smart and hardworking and educated, to keep a good, high-paying job in the investment business for your entire career. You can make millions without being a great investor. You can learn to outperform the averages by a couple points a year through hard work and an above average IQ and a lot of study. So there is no reason to be discouraged by what I’m saying today. You can have a really successful, lucrative career even if you’re not the next Warren Buffett. But you can’t compound money at 20% forever unless you have that hard-wired into your brain from the age of 10 or 11 or 12. I’m not sure if it’s nature or nurture, but by the time you’re a teenager, if you don’t already have it, you can’t get it. By the time your brain is developed, you either have the ability to run circles around other investors or you don’t. Going to Harvard won’t change that and reading every book ever written on investing won’t either. Neither will years of experience. All of these things are necessary if you want to become a great investor, but in and of themselves aren’t enough because all of them can be duplicated by competitors. As an analogy, think about competitive strategy in the corporate world. I’m sure all of you have had, or will have, a strategy course while you’re here. Maybe you’ll study Michael Porter’s research and his books, which is what I did on my own before I entered business school. I learned a lot from reading his books and still use it all the time when analyzing companies. Now, as a CEO of a company, what are the types of advantages that help protect you from the competition? How do you get to the point where you have a wide economic moat, as Buffett calls it? Well one thing that isn’t a source of a moat is technology because that can be duplicated and always will be, eventually, if that’s the only advantage you have. Your best hope in a situation like this is to be acquired or go public and sell all your shares before investors realize you donít have a sustainable advantage. Technology is one type of advantage that’s short-lived. There are others, such as a good management team or a catchy advertising campaign or a hot fashion trend. These things produce temporary advantages but they change over time, or can be duplicated by competitors. An economic moat is a structural thing. It’s like Southwest Airlines in the 1990s, it was so deeply ingrained in the company culture, in every employee, that no one could copy it, even though everyone kind of knew how Southwest was doing it. If your competitors know your secret and yet still can’t copy it, that’s a structural advantage. That’s a moat. The way I see it, there are really only four sources of economic moats that are hard to duplicate, and thus, long-lasting. One source would be economies of scale and scope. Wal-Mart is an example of this, as is Cintas in the uniform rental business or Procter & Gamble or Home Depot and Lowe’s. Another source is the network affect, ala eBay or Mastercard or Visa or American Express. A third would be intellectual property rights, such as patents, trademarks, regulatory approvals, or customer goodwill. Disney, Nike, or Genentech would be good examples here. A fourth and final type of moat would be high customer switching costs. Paychex and Microsoft are great examples of companies that benefit from high customer switching costs. These are the only four types of competitive advantages that are durable, because they are very difficult for competitors to duplicate. And just like a company needs to develop a moat or suffer from mediocrity, an investor needs some sort of edge over the competition or he’ll suffer from mediocrity. There are 8,000 hedge funds and 10,000 mutual funds and millions of individuals trying to play the stock market every day. How can you get an advantage over all these people? What are the sources of the moat? Well, one thing that is not a source is reading a lot of books and magazines and newspapers. Anyone can read a book. Reading is incredibly important, but it won’t give you a big advantage over others. It will just allow you to keep up. Everyone reads a lot in this business. Some read more than others, but I don’t necessarily think there’s a correlation between investment performance and number of books read. Once you reach a certain point in your knowledge base, there are diminishing returns to reading more. And in fact, reading too much news can actually be detrimental to performance because you start to believe all the crap the journalists pump out to sell more papers. Another thing that won’t make you a great investor is an MBA from a top school or a CFA or PhD or CPA or MS or any of the other dozens of possible degrees and designations you can obtain. Harvard can’t teach you to be a great investor. Neither can my alma mater, Northwestern University, or Chicago, or Wharton, or Stanford. I like to say that an MBA is the best way to learn how to exactly, precisely, equal the market return. You can reduce your tracking error dramatically by getting an MBA. This often results in a big paycheck even though it’s the antithesis of what a great investor does. You can’t buy or study your way to being a great investor. These things won’t give you a moat. They are simply things that make it easier to get invited into the poker game. Experience is another over-rated thing. I mean, it’s incredibly important, but it’s not a source of competitive advantage. It’s another thing that is just required for admission. At some point the value of experience reaches the point of diminishing returns. If that wasn’t true, all the great money managers would have their best years in their 60s and 70s and 80s, and we know that’s not true. So some level of experience is necessary to play the game, but at some point, it doesn’t help any more and in any event, itís not a source of an economic moat for an investor. Charlie Munger talks about this when he says you can recognize when someone gets it right away, and sometimes it’s someone who has almost no investing experience. So what are the sources of competitive advantage for an investor? Just as with a company or an industry, the moats for investors are structural. They have to do with psychology, and psychology is hard wired into your brain. It’s a part of you. You can’t do much to change it even if you read a lot of books on the subject. The way I see it, there are at least seven traits great investors share that are true sources of advantage because they canít be learned once a person reaches adulthood. In fact, some of them can’t be learned at all; you’re either born with them or you aren’t. Is the ability to buy stocks while others are panicking and sell stocks while others are euphoric. Everyone thinks they can do this, but then when October 19, 1987 comes around and the market is crashing all around you, almost no one has the stomach to buy. When the year 1999 comes around and the market is going up almost every day, you can’t bring yourself to sell because if you do, you may fall behind your peers. The vast majority of the people who manage money have MBAs and high IQs and have read a lot of books. By late 1999, all these people knew with great certainty that stocks were overvalued, and yet they couldn’t bring themselves to take money off the table because of the ìinstitutional imperative, as Buffett calls it. The second character trait of a great investor is that he is obsessive about playing the game and wanting to win. These people don’t just enjoy investing; they live it. They wake up in the morning and the first thing they think about, while they’re still half asleep, is a stock they have been researching, or one of the stocks they are thinking about selling, or what the greatest risk to their portfolio is and how they’re going to neutralize that risk. They often have a hard time with personal relationships because, though they may truly enjoy other people, they don’t always give them much time. Their head is always in the clouds, dreaming about stocks. Unfortunately, you can’t learn to be obsessive about something. You either are, or you aren’t. And if you aren’t, you can’t be the next Bruce Berkowitz. A third trait is the willingness to learn from past mistakes. The thing that is so hard for people and what sets some investors apart is an intense desire to learn from their own mistakes so they can avoid repeating them. Most people would much rather just move on and ignore the dumb things they’ve done in the past. I believe the term for this is repression. But if you ignore mistakes without fully analyzing them, you will undoubtedly make a similar mistake later in your career. And in fact, even if you do analyze them it ís tough to avoid repeating the same mistakes. A fourth trait is an inherent sense of risk based on common sense. The ability to do this is not as prevalent among human beings as you might think. I believe the greatest risk control is common sense, but people fall into the habit of sleeping well at night because the computer says they should. They ignore common sense, a mistake I see repeated over and over in the investment world. Great investors have confidence in their own convictions and stick with them, even when facing criticism. Buffett never get into the dot-com mania though he was being criticized publicly for ignoring technology stocks. Of course, it worked out brilliantly for him and made Barron’s look like a perfect contrary indicator. Personally, I’m amazed at how little conviction most investors have in the stocks they buy. Instead of putting 20% of their portfolio into a stock, as the Kelly Formula might say to do, they’ll put 2% into it. Mathematically, using the Kelly Formula, it can be shown that a 2% position is the equivalent of betting on a stock has only a 51% chance of going up, and a 49% chance of going down. Why would you waste your time even making that bet? These guys are getting paid $1 million a year to identify stocks with a 51% chance of going up? It’s insane. In business school, I met a lot of people who were incredibly smart. But those who were majoring in finance couldn’t write worth a damn and had a hard time coming up with inventive ways to look at a problem. I was a little shocked at this. I later learned that some really smart people have only one side of their brains working, and that is enough to do very well in the world but not enough to be an entrepreneurial investor who thinks differently from the masses. On the other hand, if the right side of your brain is dominant, you probably loathe math and therefore you don’t often find these people in the world of finance to begin with. So finance people tend to be very left-brain oriented and I think that’s a problem. I believe a great investor needs to have both sides turned on. As an investor, you need to perform calculations and have a logical investment thesis. This is your left brain working. But you also need to be able to do things such as judging a management team from subtle cues they give off. You need to be able to step back and take a big picture view of certain situations rather than analyzing them to death. You need to have a sense of humor and humility and common sense. And most important, I believe you need to be a good writer. Look at Buffett; he’s one of the best writers ever in the business world. It’s not a coincidence that he’s also one of the best investors of all time. If you can’t write clearly, it is my opinion that you don’t think very clearly. And if you don’t think clearly, you’re in trouble. There are a lot of people who have genius IQs who can’t think clearly, though they can figure out bond or option pricing in their heads. And finally the most important, and rarest, trait of all: The ability to live through volatility without changing your investment thought process. This is almost impossible for most people to do; when the chips are down they have a terrible time not selling their stocks at a loss. They have a really hard time getting themselves to average down or to put any money into stocks at all when the market is going down. People don’t like short term pain even if it would result in better long-term results. Very few investors can handle the volatility required for high portfolio returns. They equate short-term volatility with risk. This is irrational; risk means that if you are wrong about a bet you make, you lose money. A swing up or down over a relatively short time period is not a loss and therefore not risk, unless you are prone to panicking at the bottom and locking in the loss. But most people just can’t see it that way; their brains won’t let them. Their panic instinct steps in and shuts down the normal brain function. I would argue that none of these traits can be learned once a person reaches adulthood. By that time, your potential to be an outstanding investor later in life has already been determined. It can be honed, but not developed from scratch because it mostly has to do with the way your brain is wired and experiences you have as a child. That doesn’t mean financial education and reading and investing experience aren’t important. Those are critical just to get into the game and keep playing. But those things can be copied by anyone. The seven traits above can’t be. Do you possess these 7 traits? We’re global macro traders. That means we go anywhere and trade anything. Stocks, futures, bonds, currencies, foreign, domestic… it doesn’t matter. If there’s positive asymmetry, we’re there. The goal is outsized profits for you and the rest of our team. You can check out our latest market research here. We want to teach you everything we know about markets. Our Investment Handbook is a good place to start. It covers our entire trading strategy from start to finish. Follow the link below and enter your email to get it delivered straight to your inbox. Click Here Get Access To The Macro Ops Handbook! You can review the rest of our training materials here. And for more in-depth free reports like our Handbook, head over to this page. The Macro Ops community is filled with diverse traders from around the world, all sharing investment ideas, trade theory, and boots-on-the-ground research. The bigger this network grows, the more we all learn and profit. To join our community and become an Operator, sign up below. We’ll also send you our Friday Macro Musings every week — a quick bulleted email of interesting market thoughts, charts, and articles we’ve come across in our research. If you have more questions about who we are and what we do at Macro Ops, be sure to visit our F.A.Q. page here. Finally, don’t hesitate to shoot me a note at alex@macro-ops.com if you need anything else. While digging into old articles about James R. Keene for a piece I’m writing I came across this nugget that I have to share — it’s so good. For those of you not familiar with Keene, he is one of the most successful market operators of the late 19th century. Jesse Livermore, when talking about the trading legends of his day, called Keene the “greatest of them all”. The man made and lost fortunes many times over and lived a life full of color. Here’s the article, written by Robertus Love in The Princeton Union on July 11, 1907. Just now those who take an interest in turf matters are hearing much about the winnings of James R Keene’s horses. It is the horses that win, not the horseman. Mr. Keene seldom bets a dollar. He is not a sport. Neither on the turf nor on the stock market does he gamble. He is a speculator on the market and a sportsman on the turf. Between a speculator and a plunger the gulf is quite as wide as that between a sportsman and a sport. These distinctions should be borne in mind by any one who cares to know the character of James R. Keene. 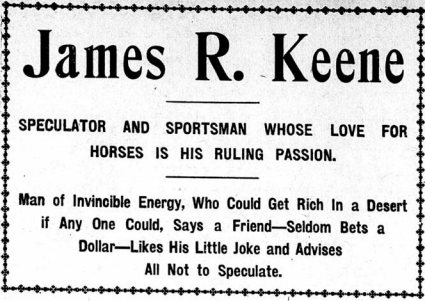 Both as speculator and sportsman Mr. Keene’s reputation clicked into the top notch at least a quarter of a century ago. It is a question whether his cash or his colts have brought him the wider distinction. Born in London sixty-eight years ago, of a father who also was a native of England, Keene nevertheless is really an American. His ancestors back of his father lived in Virginia for several generations. Moreover, when the father failed in business abroad the family came to America, settling in California when young James was only about fourteen. The boy got a job taking care of cows and mules at a military post. He worked at various occupations until he grew up, when he studied law. For a time he taught school. Then he edited a country newspaper at a place called Horsetown, in northern California. The name of the town probably had no particular influence upon Mr. Keene’s career. 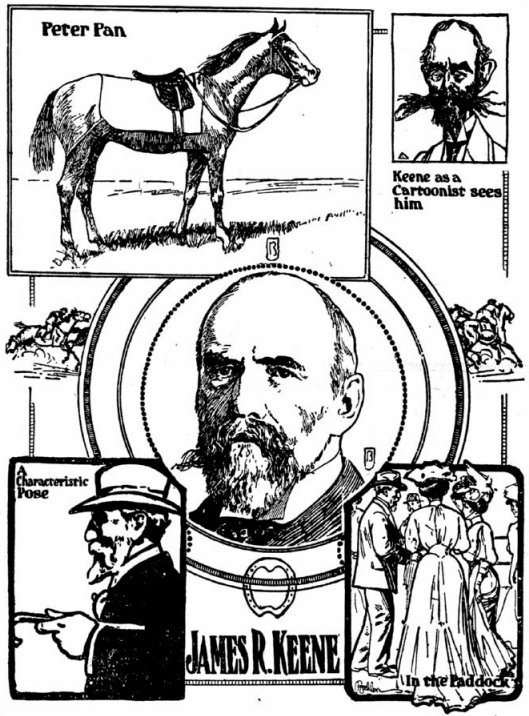 The late Charles A. Dana, who used to read the Keene editorials, maintained to the last that for style, force and lucidity the pen of no English writer since the days of Charles Lamb surpassed that of Keene when he edited the Horsetown sheet at a salary of $20 a week. Nobody had any confidence in Keene’s speculative ability—that is, nobody but himself. He believed that he could make good. He kept to the curbstone and hoed a mighty hard row until he met Senator Felton of California. The senator had a seat in the San Francisco Stock Exchange. He liked Keene. When Felton became assistant United States treasurer he gave Keene his seat on the exchange, to be paid for at whatever it might be worth when the young man was able to pay. A few months later Keene paid Felton several times the value of the seat at the time he acquired it, but he was making money so rapidly that the outlay was not felt. By 1876 James R. Keene had made several millions — some say $6,000,000 — by speculating in mining stocks during the “Bonanza” period. Then his health failed and he determined on a trip to Europe. When Keene reached New York the Wall street atmosphere so charmed him that he did not go to Europe for fifteen years. He stayed in Wall street and speculated. One of the most familiar stories of the street is to the effect that somebody remarked to Jay Gould, then the wizard of Wall street. Jay Gould After His Scalp. Those were the days of the individual speculator. This is the day of combinations. Keene went it alone, used his judgment and made large winnings. But Jay Gould was after his scalp. By the year 1884 Keene’s fortune had more than doubled. Then he got into a combination against his own judgment to corner the world’s wheat market. Just when it seemed that all was ready for the big rake off Jay Gould and others sprang a coup that came near shipping Keene back by the box car route. There is still in the street the tradition of a forged telegram which split the corner and smashed Keene to smithereens. When he crawled out from under the avalanche he was about a million and a half in debt. Everything went, including one of Rosa Bonheur’s masterpieces, “Sheep,” which was the pride of Keene’s household. A little later a gentleman now well known in New York journalism had occasion to call at Jay Gould’s residence on Fifth avenue. Gould pointed to a magnificent oil painting on the wall. The painting was Rosa Bonheur’s “Sheep.” Gould had bought it at a fabulous price from the man who bid it In at the Keene sale. Gould gloated over it. As a work of art it meant little or nothing to the wizard, but as his badge of victory it was to him a trophy as satisfactory as is the dripping scalp of a paleface to an Indian chief. Wall street sometimes makes men so. Jay Gould has been dead these many years. Keene still walks Wall street, having paid off all his debts and made several fortunes since 1884. But for some years Keene was not so much of a figure in the street. Again they said that he was down and out, just as they had said it when he first lost his money in San Francisco. He became during those years more of a promoter than an independent operator. Having eaten of bitter bread in the wheat corner, Keene took up something to sweeten existence. He boomed sugar for the Havemeyers. Incidentally he boomed it for Keene, sweetening his tooth to the extent of some $2,000,000. Then Keene bit off a large chew of tobacco, but not larger than he could chew. Practically the same ring that had tripped him up in the wheat bin tried to strangle him with tobacco juice, but Keene was keeping his own counsel then. He had grown cautious. He rushed 75,000 shares of tobacco into the market, the price dropped from 156 to 115. The ring lost and Keene won a million and a half in a day. “Give a man rope enough and he will hang himself,” says a wise one. Keene took a lot of rope—American Cordage—and added a few more millions to his pile, incidentally stringing up a few of his enemies. By that time, which was a matter of nine or ten years ago, James R. Keene had succeeded in convincing Wall street that if he ever returned to California he could go in his own private palace car or in an airship if he preferred to take that risk. There have been ups and downs since, but never an out, though it is understood that Mr. Keene lost largely by the failure of his son-in-law’s firm, Talbot J. Taylor & Co, about four years ago. But the Keene family larder was secure in any event. Many years ago a silent partner, Mrs. Keene, persuaded her husband to give her half of his earnings. When Mr. Keene made a million Mrs. Keene was half a million richer. As the silent partner did not speculate, the money remained in the family. His First Big Horse Victory. Mr. Keene is known as a man of indomitable energy. “He could get rich in a desert if any one could,” says an intimate associate. This recalls a story in connection with the first big horseflesh victory of Keene’s career. His horse Foxhall won the Grand Prix at Paris in 1881. Twenty years earlier Keene had been at his Horsetown stage, and one of his acquaintances In the California country was Dan Gaitland. When Foxhall won the Grand Prix, Dan was still prospecting up in Grant county, Ore., not far north of Horsetown. He heard the news and rushed into the presence of Tom Merry, another acquaintance of the California Keene. Mr. Keene has owned some of the greatest horses on the turf. This season his colt Peter Pan earned $52,000 in four races in less than thirty days. He owned Domino, over whose Kentucky grave he erected a hand some marble shaft. Other great ones developed by Keene were Sysonby, Commando, Cap and Bells and Tommy Atkins. When Scully was dragged into the inner sanctum he protested that he was taking up Mr. Keene’s time. “Not by any means,” replied Keene. “I can talk stocks any day, but it isn’t often that I get to talk horse with a Kentuckian. “That’s a disguised way of saying that John D. poured oil on the troubled waters,” remarked Mr. Keene. A country boy in Indiana wrote Mr. Keene that he wanted to make a fortune, but so many doors were closed to him that he didn’t know which one to open. “Open the one labeled ‘Push,'” wrote back the financier.